Begun in 2016, the Stranger Things series is the surprise hit of the Netflix platform. Oscillating work between fantasy, science fiction and slice of life - the name of these drawer intrigues focusing on the everyday lives of characters living in the same place like Twin Peaks - the series of Matt and Ross Duffer pays tribute to the popular culture of the 1980s by resuscitating some of his past glories such as Winona Ryder (Beetlejuice), Sean Astin (the Goonies) or Matthew Modine (Full Metal Jacket). 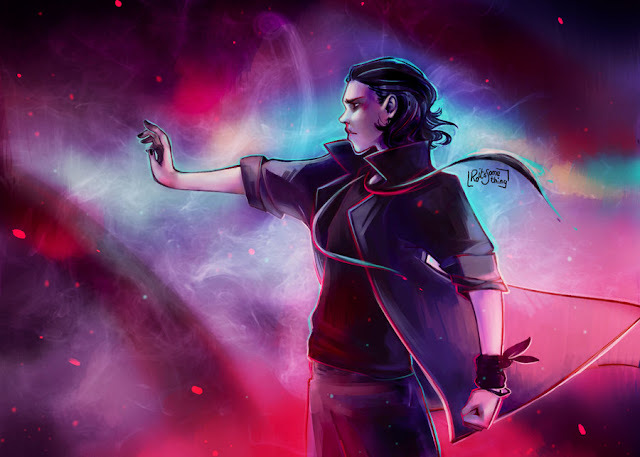 In its second season, the series is more ambitious in terms of intrigues and themes but also more referential to the era of his diegetic universe. Yet for many years now, many works have challenged themselves to resurrect the 80s with much tribute but also subterfuges sometimes easy. How then can a series like Stranger Things happen almost after the battle and embark on such a venture without necessarily falling into the pitfalls inherent in our time? It is no coincidence that we are talking about the decade of American media, art and cultural overproduction as "Reagan years". The fortieth president of the United States, former actor, is the very symbol of this excess whose color specters still haunt the minds when we pronounce the fateful expression of the 80s. From furious clips of Cyndi Lauper to Steven Spielberg's adventure films to the escapades of the various rockstars of the time, this maelstrom of popular culture is an inexhaustible reservoir for anyone who today would like to represent these ten orgiastic years. At the moment Denis Villeneuve finally offers a sequel to Blade Runner and where those who made the luster of these years disappear gradually, like George Michael or David Bowie, a series like Stranger Things comes at the right time, offering a different vision of the clichés ginned in recent years in different media artistic. Because the 80s and 80s are often used. The ingredients often used to define an "eighties" atmosphere are generally reduced to colored lighting, music synthesizer, some standards of the time and obsolete gadgets like huge mobile phones, shoes that blink or the hilarious walkman. Do we want to represent the real 80s? What did the films of the day leave us in memory of? Or simply a fantasy version of this decade seen by current artists? Implied who did not know the 80s? For a work, whatever the period of which it speaks, says more about that of its production. David Sandberg's short film Kung Fury is the perfect example: released in 2015, this pastiche of 80s action and sci-fi movies uses the extreme of what we call the "Neon cinematography", representing the Reagan years by misusing its motives, even its clichés. With an avalanche of digital effects, Kung Fury do not deceive and the Canada Dry effect is inevitable: it smells of the 80s, it tastes of the 80s, but it is not the 80s, simply an imitation by the year 2010. It does not remove anything that the film remains a true homage not to the cinema of the time but more to the arcade games like Streets of Rage or Double Dragon. Other audiovisual productions have abandoned digital effects - a real anachronism for the 80's purists - to focus on other elements. Even if the ever-present neon are almost every David Leitch's Atomic Blonde sequence or Owen Harris's "San Junipero" TV movie, fourth episode of Black Mirror season 3 , this is another process that is used to that the spectator feels immediately transported thirty years back: the music. If the synthesizer instrument-totem of the decade is actually present, it is often the additional tracks taken here and there in various compilations that feed the general atmosphere of these two works: "Atomic Blonde" opens on "Blue Monday" by New wave band New Order and concludes with "Under Pressure" by David Bowie and Freddie Mercury, while "San Junipero" is "Heaven Is a Place on Earth" by Belinda Carlisle. All these reasons so 80s working diegetic placing these works in a particular context: the fall of the Berlin Wall for the film Leitch and a nostalgic utopia populated by nightclubs and arcades, places to neon obviously, for the episode of Black Mirror. Light, color, frenzied rhythms: everything borders on the spatio-temporal journey to the Reagan years. Yet this decade rich in mass cultural successes can be represented much less frontally, more referenced and ultimately much more faithful to reality. For Stranger Things, the Duffer brothers and their directors are going to appeal more to the process of happy few, these references resonating with attentive viewers feeling both nostalgic and rewarded for recognizing them: a looser club reminiscent of Stephen King's It released in 1986, these kids going on an adventure on bikes like in The Goonies by Richard Donner in 1985 or the presence of Sean Astin in the cast of season 2 to support a little more the link with the previous work. 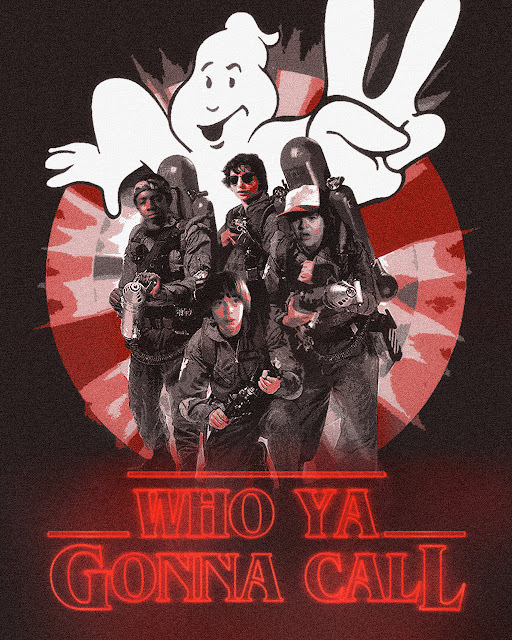 Netflix's new flagship series is a melting pot of references sometimes hidden within the narrative construction or themes sometimes openly assumed as evidenced by the episode "Trick or Treat Freak" in which the festivities of Halloween serve as a pretext for showrunners to loudly shout their love of the Ghostbusters franchise, right down to the final twist. Stranger Things does not play the card of the neon colorimetry to anchor itself in a reality fantasized by dint of clichés but prefers to pay tribute to the culture of the time which amounts, in other words, to assume its fictional dimension and to claim oneself as such. After all, except the Blade Runner from Ridley Scott and Roger Donaldson's Cocktail poster, neon lights are not so present in the 80s. Like Andres Muschietti's new adaptation of It, Matt and Ross Duffer's series gives pride of place to naturalistic images, with the exception of purely science-fiction sequences, focusing more on everyday life. a small American city in 1984 between bike rides, Dungeons and Dragons evenings and tasting Eggo waffles. Everything is in the detail and not in the bidding of visual effects as is the case for the parody clip "Through the Night" Grum electro group. Everything happens at the production level, in the choice of accessories, costumes and sets, and not in post-production, with a lot of color filters and musical pieces chosen according to their place in the billboard. If some typical sounds ranging from Cyndi Lauper's "Time After Time" to The Police's "Every Breath You Take" sporadically get the characters to dance, so does Anthrax's "Trust" revival in It , Stranger Things abandon the quasi-systematic reflex of the vintage jukebox proper to productions that anchor their diegesis in a predefined time. The two creators will also admit in the second episode of the making-of series "Beyond Stranger Things" that the bulk of the musical budget of the second season focuses on the final scene of the Snowball. Yet, although particularly naturalistic in its desire to represent, resurrect the popular culture of the 80s, Stranger Things, like the new adaptation of It, do not go to the end of his intentions. Digital is always very present, either in the sequences around the portal leading to the lair of the Mind Flayer, the representations of this creature or even the Demogorgon of the first season. In the 1980s, studio sets and animatronic puppets would have replaced this deluge of special effects generated by computers, as can still be witnessed by Joe Dante's Gremlins or ET from Steven Spielberg, these cocoon works that will soon be resurfacing on our screens as the smoke slowly rises from the cups of hot chocolate and the snow falls peacefully into the night lit by the Christmas lights. Usually neon lights. 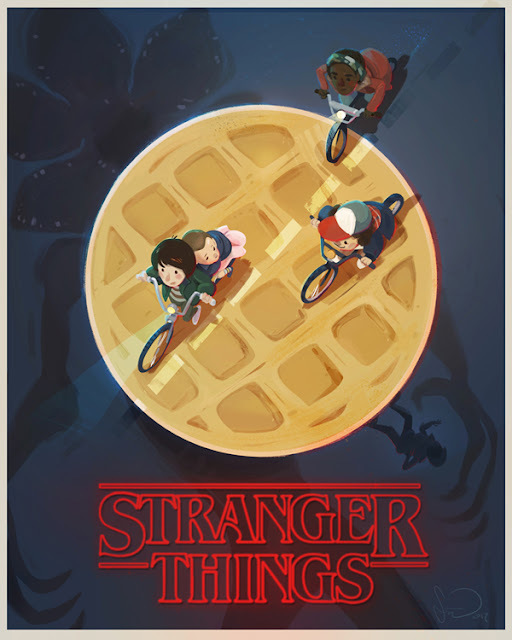 Débutée en 2016, la série Stranger Things est le succès-surprise de la plateforme Netflix. Œuvre oscillant entre le fantastique, la science-fiction et le slice of life – du nom de ces intrigues à tiroir se focalisant sur le quotidien de personnages vivant dans un même lieu à l’instar de Twin Peaks – la série de Matt et Ross Duffer rend hommage à la culture populaire des années 1980 en ressuscitant notamment quelques-unes de ses gloires passées comme Winona Ryder (Beetlejuice), Sean Astin (les Goonies) ou encore Matthew Modine (Full Metal Jacket). Dans sa deuxième saison, la série se veut plus ambitieuse en terme d’intrigues et de thématiques mais également plus référentielle concernant l’époque de son univers diégétique. Pourtant, depuis bien des années maintenant, de nombreuses œuvres se sont lancé pour défi de ressusciter la décennie 80 à grand renfort d’hommages mais aussi de subterfuges parfois faciles. Comment alors une série comme Stranger Things peut-elle arriver presque après la bataille et se lancer dans une telle entreprise sans nécessairement tomber dans les pièges inhérents à notre époque ? Ce n’est pas un hasard si on parle de la décennie de la surproduction médiatique, artistique et culturelle américaine comme des « années Reagan ». Le quarantième président des États-Unis, ancien acteur, est le symbole même de cette outrance dont les spectres colorés hantent encore les esprits dès lors que l’on prononce l’expression fatidique d’années 80. Des clips endiablés de Cyndi Lauper aux films d’aventure de Steven Spielberg en passant par les frasques des différentes rockstars de l’époque, ce maelström de culture populaire est un réservoir inépuisable pour quiconque voudrait aujourd’hui représenter ces dix années orgiaques. À l’heure ou Denis Villeneuve offre enfin une suite à Blade Runner et où ceux qui ont fait le lustre de ces années disparaissent progressivement, à l’instar de George Michael ou de David Bowie, une série comme Stranger Things arrive à point nommé, proposant une vision différente des poncifs égrenés ces dernières années dans les différents médias artistiques. Car il y a années 80 et années 80. Les ingrédients souvent employés pour définir une ambiance « eighties » se réduisent généralement à des éclairages colorés, une musique au synthétiseur, quelques standards de l’époque et des gadgets désuets comme d’énormes téléphones portables, des chaussures qui clignotent ou encore l’inénarrable walkman. Veut-on représenter les années 80 réelles ? Celles que les films de l’époque nous ont laissé en mémoire ? Ou simplement une version fantasmée de cette décennie vue par les artistes actuels ? Sous-entendu qui n’ont pas connu les années 80 ? Car une œuvre, quelle que soit l’époque dont elle parle, en dit davantage sur celle de sa production. Le court-métrage Kung Fury de David Sandberg en est le parfait exemple: sorti en 2015, ce pastiche des films et animés d’action et de science-fiction des années 80 use à l’extrême de ce que l’on désignera comme la « cinématographie des néons », soit le fait de représenter les années Reagan en abusant de ses motifs, voire de ses clichés. Avec une avalanche d’effets numériques, Kung Fury ne trompe pas et l’effet Canada Dry est inévitable: ça sent les années 80, ça a le goût des années 80, mais ça n’est pas les années 80, simplement une imitation par les années 2010. 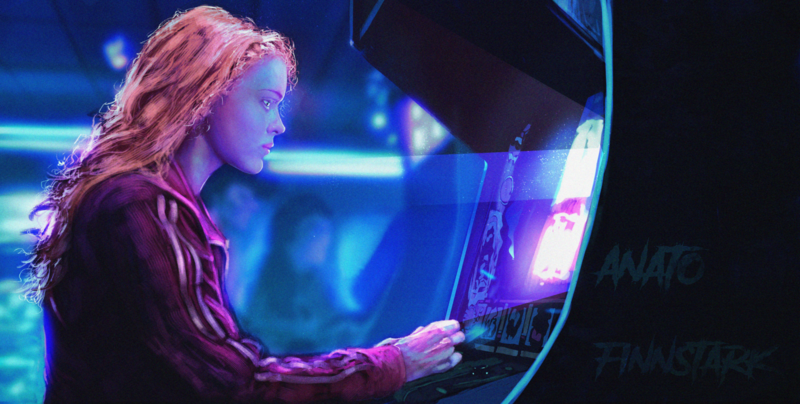 Cela n’enlève en rien que le film demeure un véritable hommage non pas au cinéma de l’époque mais davantage aux jeux d’arcade comme Streets of Rage ou encore Double Dragon. D’autres productions audiovisuelles ont su délaisser les effets numériques – véritable anachronisme pour les puristes des 80’s – pour se focaliser sur d’autres éléments. Même si les sempiternels néons se retrouvent presque à chaque séquence d’Atomic Blonde de David Leitch ou du téléfilm « San Junipero » d’Owen Harris, quatrième épisode de la saison 3 de Black Mirror, c’est un autre procédé qui est employé pour que le spectateur se sente aussitôt transporté une trentaine d’années en arrière : la musique. Si le synthétiseur, instrument-totem de la décennie, est effectivement présent, ce sont bien souvent les pistes additionnelles piochées çà et là dans des compilations diverses qui alimentent l’ambiance générale de ces deux œuvres : « Atomic Blonde » s’ouvre sur « Blue Monday » du groupe new wave New Order et se conclue sur « Under Pressure » de David Bowie et Freddie Mercury, tandis que l’hymne de « San Junipero » est « Heaven Is a Place on Earth » de Belinda Carlisle. Tous ces motifs so 80s travaillent à placer la diégèse de ces œuvres dans un contexte particulier : la chute du mur de Berlin pour le film de Leitch et une utopie nostalgique peuplé de discothèques et de salles d’arcade, des lieux à néons évidemment, pour l’épisode de Black Mirror. Lumière, couleur, rythmes endiablés: tout confine au voyage spatio-temporel à destination des années Reagan. Pourtant, cette décennie riche en succès culturels de masse peut être représentée de façon bien moins frontale, plus référencée et, finalement bien plus fidèle à la réalité. Black Mirror, saison 3, épisode 4 : « San Junipero » (Netflix). Pour Stranger Things, les frères Duffer et leurs réalisateurs vont davantage faire appel au processus de happy few, ces références qui résonnent face aux téléspectateurs attentifs se sentant à la fois nostalgiques et récompensés de les reconnaître : un club des loosers rappelant celui du It de Stephen King sorti en 1986, ces gamins partant à l’aventure en vélos comme dans The Goonies de Richard Donner en 1985 ou encore la présence de Sean Astin au casting de la saison 2 pour appuyer un peu plus le lien avec l’œuvre précédente. La nouvelle série phare de Netflix est un melting pot de références tantôt cachées au sein de la construction narrative ou des thèmes abordés tantôt ouvertement assumées comme en témoigne l’épisode « Trick or Treat Freak » dans lequel les festivités d’Halloween servent de prétexte aux showrunners pour crier haut et fort leur amour de la franchise Ghostbusters, et ce jusque dans le twist final. Stranger Things ne joue pas la carte de la colorimétrie au néon pour s’ancrer dans une réalité fantasmée à force de clichés mais préfère rendre hommage à la culture de l’époque ce qui revient, en d’autres termes, à assumer sa dimension fictionnelle et à se revendiquer comme telle. Après tout, hormis le Blade Runner de Ridley Scott et l’affiche de Cocktail de Roger Donaldson, les néons ne sont pas si présents dans les années 80. Stranger Things, saison 2, épisode 2 : « Trick or Treat Freak » (Netflix). À l’instar de la nouvelle adaptation de It par Andrés Muschietti, la série de Matt et Ross Duffer fait la part belle aux images naturalistes, si l’on excepte les séquences purement science-fictionnelles, s’attardant davantage sur le quotidien d’une petite ville américaine en 1984 entre balades à vélo, soirées Donjons et Dragons et dégustation de gaufres Eggo. Tout est dans le détail et non dans la surenchère d’effets visuels comme c’est le cas pour le clip parodique « Through the Night » du groupe électro Grum. Tout se passe au niveau de la production, dans le choix des accessoires, des costumes et des décors, et non en post-production, à grand renfort de filtres de couleur et de morceaux musicaux choisis selon leur place dans le billboard. Si quelques sons typiques allant de « Time After Time » de Cyndi Lauper à « Every Breath You Take » de The Police viennent sporadiquement faire danser les personnages, tout comme la reprise de « Trust » par Anthrax dans It, Stranger Things délaisse ce réflexe quasiment systématique du juke-box vintage propre aux productions qui ancrent leur diégèse dans une époque prédéfinie. Les deux créateurs avoueront d’ailleurs dans le second épisode de la série making-of « Beyond Stranger Things » que l’essentiel du budget musical de la seconde saison se concentre sur la scène finale du Snowball. 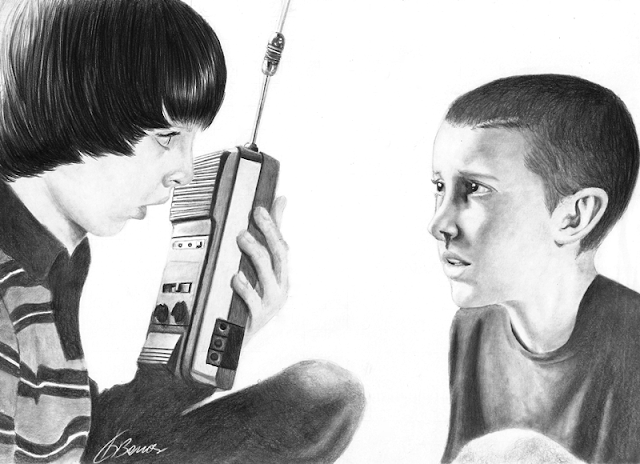 Pourtant, bien que particulièrement naturaliste dans sa volonté de représenter, de ressusciter la culture populaire des années 80, Stranger Things, à l’instar de la nouvelle adaptation de It, ne vas pas au bout de ses intentions. Le numérique est toujours très présent, que ce soit dans les séquences aux abords du portail menant à l’antre du Mind Flayer, les représentations de cette créature ou même du Démogorgon de la première saison. Dans les années 80, des décors de studios et des marionnettes animatroniques auraient remplacé ce déluge d’effet spéciaux générés par ordinateurs, comme peuvent encore en témoigner Gremlins de Joe Dante ou encore E.T. de Steven Spielberg, ces œuvres cocons qui bientôt ressurgiront sur nos écrans alors que la fumée s’élèvera doucement des tasses de chocolat chaud et que la neige tombera paisiblement dans la nuit éclairée par les lumières de Noël. Généralement des néons. 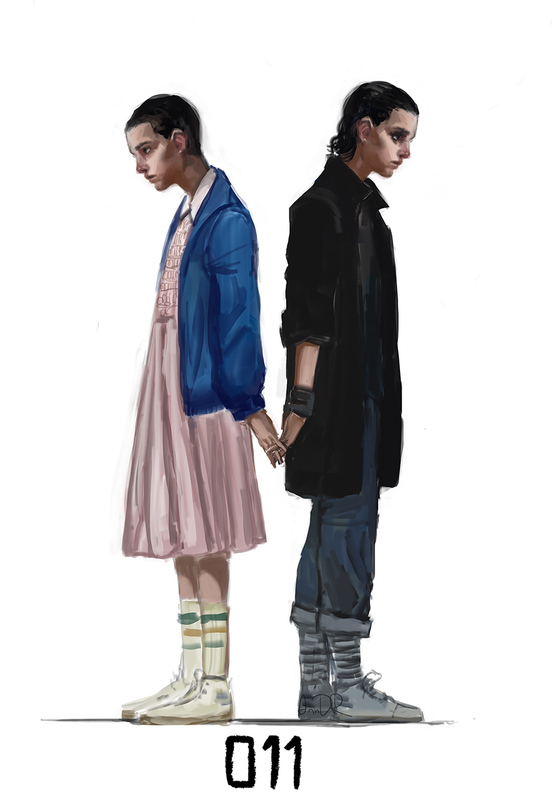 Le duel final de la saison 1 : Eleven face au Démogorgon (Netflix). L’utilisation de stroboscopes, justifiée dans la diégèse par le clignotement des ampoules provoqué en présence du monstre, sert également à masquer les éventuels défauts plastiques de la créature en images de synthèse.